The owner of this swimming pool at a large residence in the suburban village of Oxshott had put the property on the market and naturally wanted the pool area to look its best. 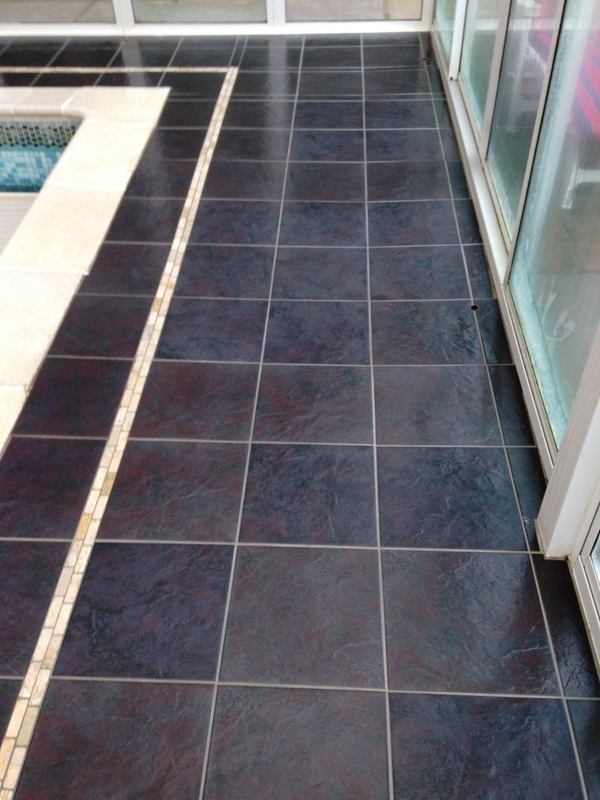 The pool was surrounded by Porcelain tiles which are very resilient and generally a good choice for a swimming pool surround, additionally the slate effect tiles in this post had a riven surface which would make them less slippery than the highly polished variety. The chemicals used in swimming pools however are quite strong and I suspect this has contributed to the build-up of Limescale on the surface of the tiles. 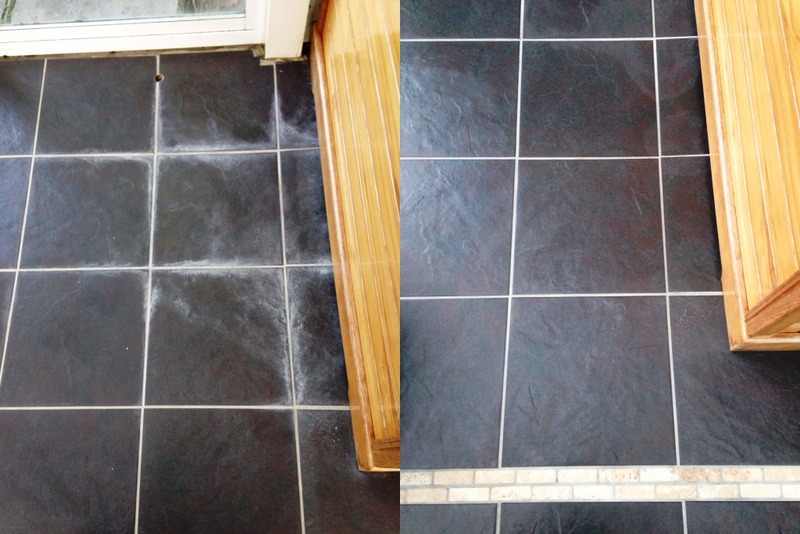 The first job was to give the tiles a deep clean and this was done by scrubbing in Tile Doctor Pro-Clean diluted 1 part cleaner to four parts hot water using a black scrubbing pad fitted to a rotary machine. 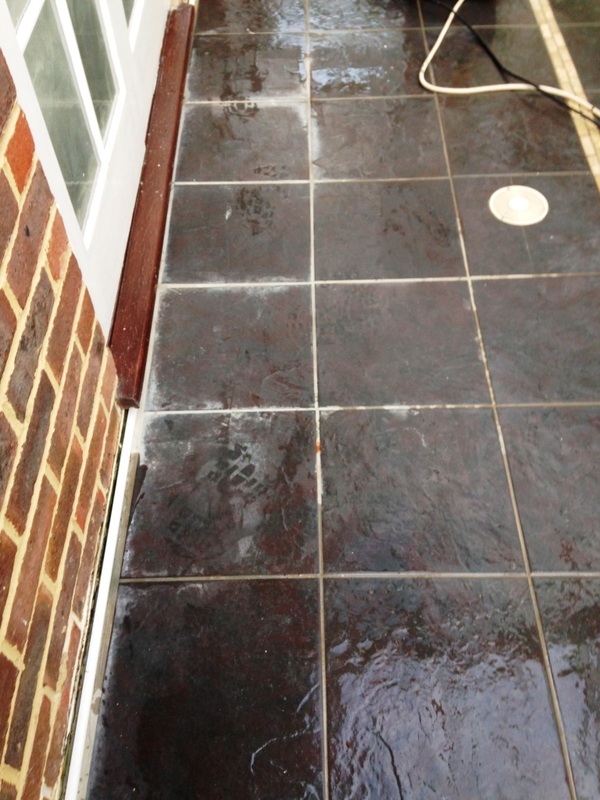 Once scrubbed the soiled cleaning solution was removed using a wet vacuum and the tiles given a thorough rinse. There were a lot of tiles to clean and naturally care has to be taken to avoid getting any cleaning solution in the pool. After rinsing the tiles were dried with the assistance of an air mover so we could get an idea of what other remedial work would be required and in this case it became clear where the areas with Limescale staining were. 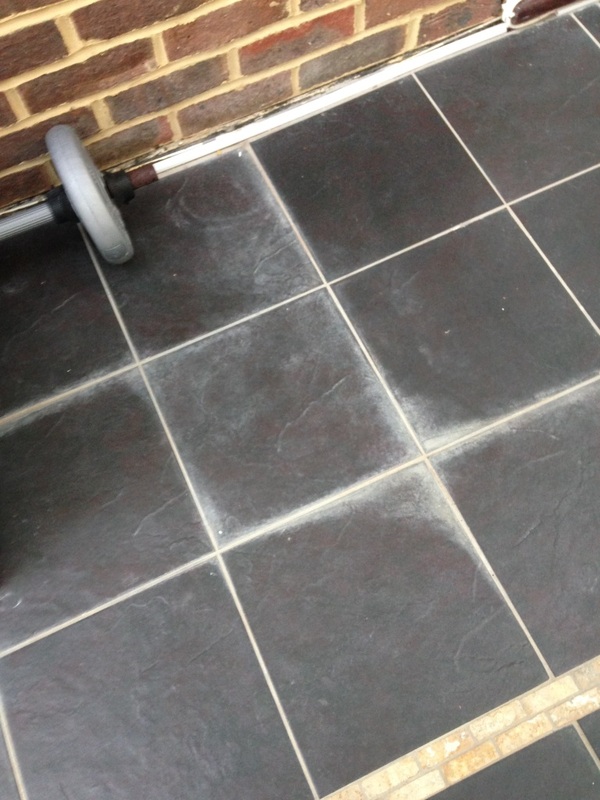 To remove the Limescale each stain was spot treated using Tile Doctor Grout Clean-up which is a strong acid based cleaning product normally used to remove grout smears from tiles but also equally useful at dealing with mineral deposits such as Limescale. 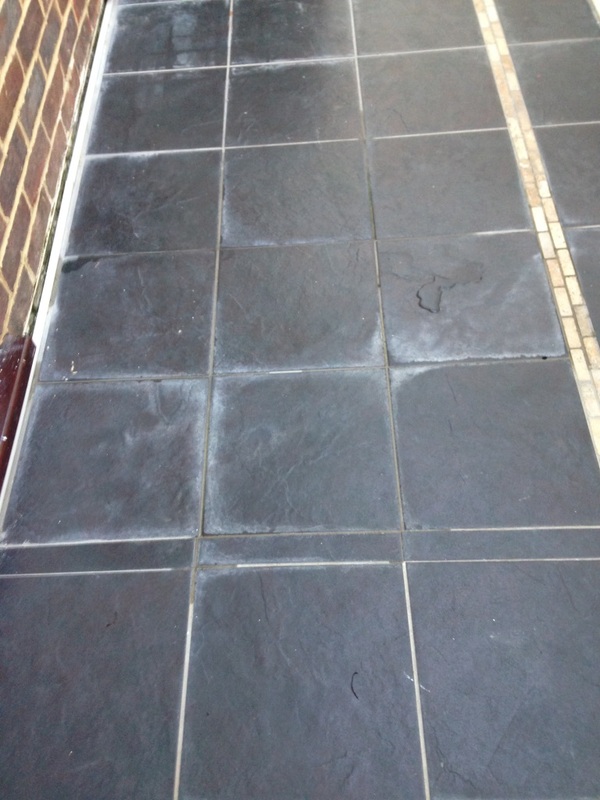 You have to be very careful with acids on tiles, especially natural stone so once it had done its job the tiles were thoroughly rinsed and the whole floor rinsed again once we have completed everything. When we had finished the client couldn’t believe the transformation we have managed to achieve. 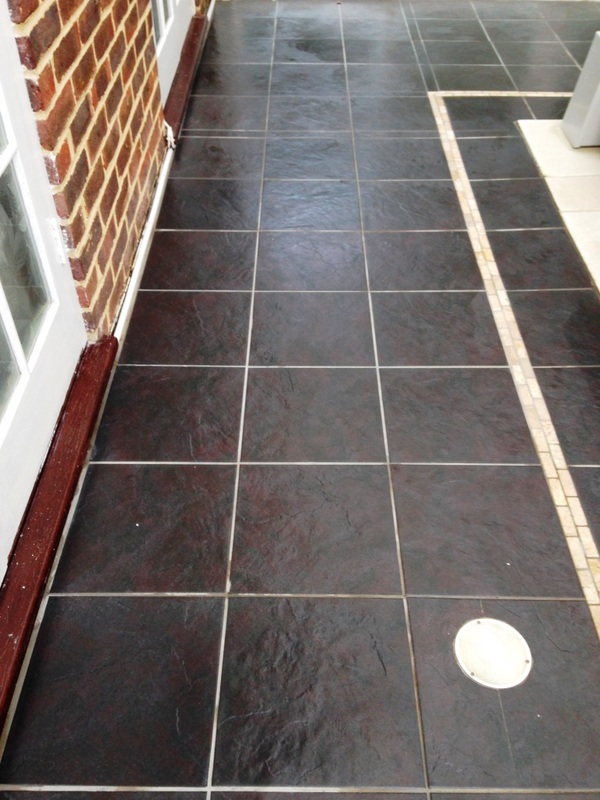 This entry was posted in Work History and tagged cleaning business, cleaning services, East Surrey, floor restoration, grout cleaning, limescale removal, Oxshott, porcelain tile restoration, porcelain tiles, tile cleaning by Bill Bailey. Bookmark the permalink. For slippery pool side tiles consider having the Tile Doctor Anti-Slip solution applied, its and invisible treatment that only activates when wet and greatly increases traction.